This was originally published on December 16, 2012 with the title Replying to my pro-gun friends. It's been edited significantly and includes a reply to Wayne LaPierre's testimony at the Senate hearing on January 30, 2013. I just wish you loved the First Amendment as much as your reading of the Second Amendment. Instead trying to bully people into submission, let us speak freely. 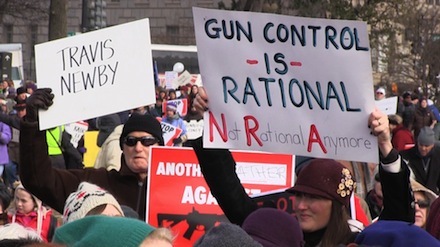 Most people aren't calling for a ban on guns contrary to your knee-jerk reactions. We want better regulations on something that is already regulated. We just want improvements. To quote my friend Jim Sanches, there's a difference between regulating and banning. In fact, I am pro-non-assault-style-guns-with-high-magazine-capacity for civilians for self-defense after thorough background checks, training, and if responsibly maintained. Respect that America needs to talk about this massacre considering many factors and nuances. So, stop making wild accusations, calling people morons, and trying to shut down discussion. Dear friends who say that guns don't kill people, people kill people: People with guns kill people. Guns are dangerous like poison is dangerous, especially guns designed for combat. It's not something we want readily available and in every home and public building. Even if people try to be responsible about its storage and usage, accidents and terrible destruction will occur, especially with children and mentally unstable people around. This is a public safety issue. If we can accept restrictions on smoking for public health reasons, why not accept restrictions on gun purchases for public safety reasons? In general, I think gun control is a public safety issue just like people flying planes or driving cars without proper training is a public safety issue. Dear friends who say we need guns to protect ourselves from the government: To beat the U.S. government, you're gonna need bigger and better weapons than guns. Would you be in favor of legalizing civilians owning tanks, bombs, fighter planes, chemical, biological and nuclear weapons? Also, if you really believe the government is out to get you, it's likely that you suffer from a mental illness. In general, I have a problem with you thinking it's patriotic to shoot government employees with your guns. Dear friends who treat the Constitution as some holy scripture from God and who think they have divined the correct, original, literal, interpretation of it: News Flash! The Founding Fathers were not psychics who could predict the future. They didn't think of everything. The Constitution doesn't mention online identity theft. Does that mean we shouldn't protect ourselves from it? The genius of the framers of the Constitution is that they wrote a living document that was designed to be amended as we go. There are limits to the Second Amendment as there is to the First Amendment. For instance, you can't yell "fire" in a crowded theater because it endangers the public. Dear friends who think we need more God in the classroom: Our country is founded on the principle of the separation of church and state because it is dangerous to mix power and religion. Historically, it's led to tyranny. No, we do not need more religion in classrooms. We need more common sense and respect for the give-and-take of our democratic process. We need to insist on fact-based, civil dialogue. Dear friends who think we need more guns in the classroom to protect our children: Why stop at arming teachers? Why not arm children? How far will you go in thinking that easy access to guns is the solution to the problem of gun violence in our society? Do you want any regulation at all? Do you want buying assault rifles to be as easy as getting a Slurpee from 7-11? Would you allow children to purchase guns? Do you really think easy access to combat weapons is about personal freedom? Do you really think that's what Founding Fathers had in mind when they made enormous sacrifices to build America? I can't understand how you're thinking about this. Dear friends who say I can't talk about gun control because I've never handled or owned a gun before: Have you ever taken crack and heroin? Do you have a position on what our laws should be regarding those drugs? Perhaps I should shoot up heroin, become an undocumented immigrant, and go to prison before I can call for ending the war on drugs, revising immigration policies and reforming the criminal justice system. Dear friends who say that Hitler confiscated guns so don't confiscate guns: First of all, the vast majority of people are not calling confiscating guns. I'm certainly not. Secondly, this is just historically false. Hitler relaxed gun control laws of the Weimar Republic. Thirdly, Hitler loved dogs and used the bathroom. It's not a great argument to say Hitler did x, so therefore don't do x.
Dear friends who say Sandy Hook is a hoax: I question the state of your mental health. If you really believe this, I think you suffer from severe paranoia and should be disqualified from buying guns. Dear friends who say "Second Amendment shall not be infringed!" no matter who is speaking, under what conditions, and which specific suggestions are made to try to keep guns away from homicidal people: I've listened to your arguments and frankly, you guys don't sound like freedom-loving, Constitution-protecting individuals. You just sound brainwashed. There are only so many ways a person can say that I don't give a crap about anyone else but myself and guns make me feel powerful and that is all that matters. Dear all friends: I'm finding that it's very hard to engage in a constructive dialogue with people hellbent on bullying you until you give up or repeating gun lobby propaganda ad nauseam. Sometimes you just have to call a spade a spade in the way Joseph Welch called out Senator McCarthy during Army-McCarthy hearings. I want to direct the same lines said by Welch in 1954 to Wayne LaPierre, CEO of the NRA, who testified at the Senate committee hearing on January 30, 2013 and shamelessly uses fear-mongering to boost gun sales: Have you no sense of decency, sir, at long last? Have you left no sense of decency? Annabel is a filmmaker and the founder of Coffee Party USA. Her new documentary project is Story of America.